Officials said External Affairs Minister Sushma Swaraj will hold extensive talks with Abdulla Shahid on Monday. Abdulla Shahid wants to repair the bilateral ties between both countries which came under severe strain. 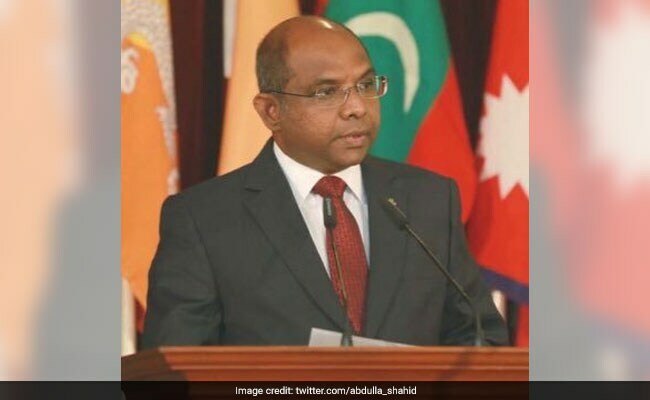 Foreign Minister of the Maldives Abdulla Shahid will arrive today on a four-day visit, with an aim to repair the bilateral ties which came under severe strain during the previous government in the island nation. Officials said External Affairs Minister Sushma Swaraj will hold extensive talks with Mr Shahid on Monday. During their meeting, PM Modi and Mohamed Solih vowed to renew close ties and friendship between the two countries and agreed on the importance of maintaining peace and security in the Indian Ocean region. Mohamed Solih, as the opposition Maldivian Democratic Party's candidate, had surprisingly defeated strongman Abdulla Yameen in the presidential election held on September 23. India-Maldives ties came under strain under Abdulla Yameen who was perceived to be close to China. Some decisions by Abdulla Yameen including imposition of restrictions on work visas for Indians and signing of a new Free Trade Agreement with Beijing also did not go down well with New Delhi. Relations between India and the Maldives deteriorated further after Abdulla Yameen imposed emergency on February 5 this year.